New school year, new first impression… make sure to make it count! 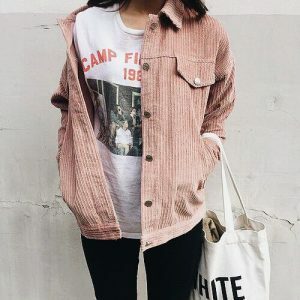 These cute first day of school outfit ideas feature a mix of cute, classy, sporty, casual and elegant looks, guaranteeing you will find the one that suits your personal style and fashion inspirations the most. 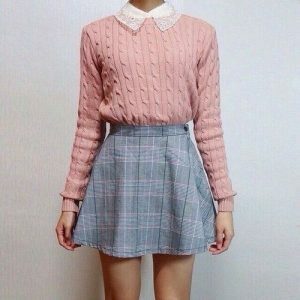 If you are looking for something appropriate for school, yet still romantic and feminine, this is the perfect outfit for you. The blouse has a flowy, detailed chiffon material which goes well together with the blush colored, high-waisted chiffon skirt. 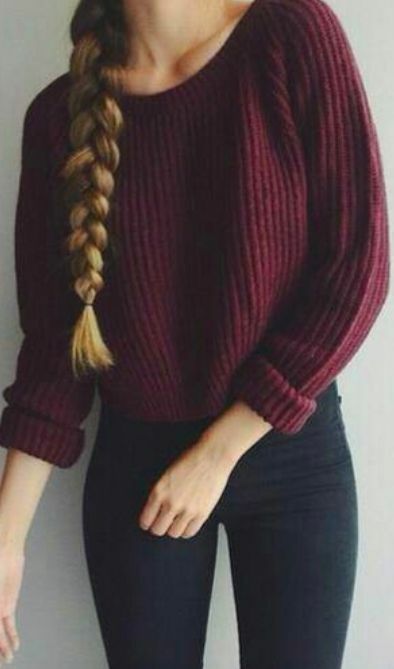 This is such a cool, youthful outfit! The chunky knit sweater will keep you comfortable and warm through the first day of school, while the denim dungaree shorts add a more playful vibe to your outfit. If you want to make it a bit more fancy, don’t forget to accessorize! 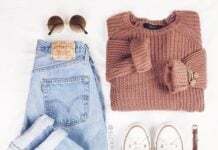 Oversized sweaters with a twist can be really ideal for the first day of school. They are not only comfortable and practical but are also 100% appropriate for school. This type is special because of the lace up detailing and the back hoodie, and it can be mixed with almost anything. The purple sweater, the pink cashmere infinity scarf and the dark gray skirt all have that special, autumn color palette, and they look absolutely beautiful matched together. This pastel pink floral sweater channels the warm weather and fun spring and summer nights, and it can be worn with any shade of denim, as well as with simple black high waisted pants. 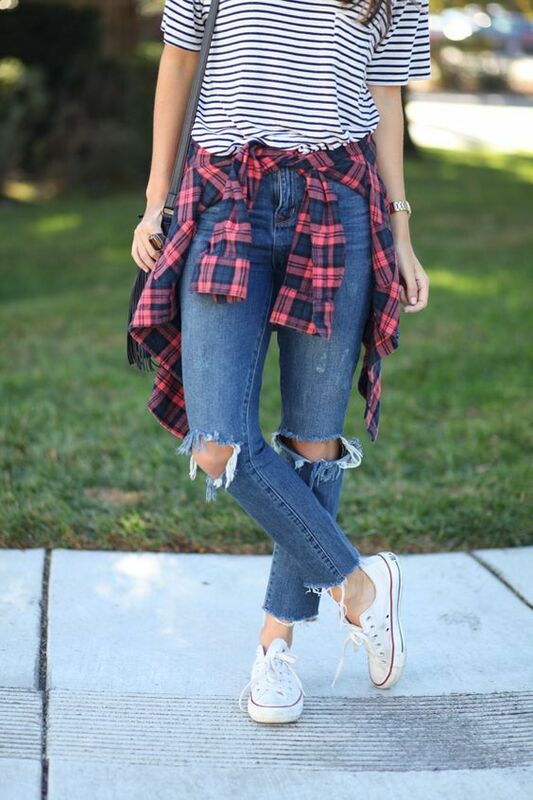 Make the outfit even more adorable by adding a denim wrap headband and creating a messy bun. Have fun with the different patterns in your wardrobe – who says you can’t mix polka dots, stripes, checkered print or florals? 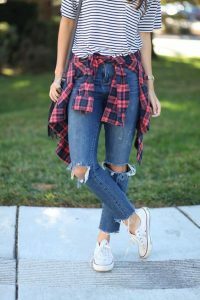 This outfit features two classics, a black and red flannel shirt and a white-blue striped simple T-shirt. To make sure your outfit is chilled and mixes these elements well, stick with neutral jeans and shoes, and keep your accessories simple with a silver bangle or stud earring. If you want something more elegant and dramatic, go with a white collar, simplistic black dress with long sleeves. 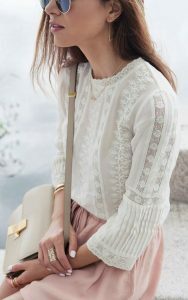 Wear it with ruffled socks and burgundy or emerald oxford shoes, and create a messy ponytail or a beautiful halo braid. If your school has stricter policies, make sure you don’t break the rules while still looking feminine and cute! To make the look more youthful, choose a printed midi skirt and mix it with a blouse, an off-shoulder sweater and a pair of sneakers. Although it is very simple and minimalistic, it is still an amazing first school day outfit choice! The burgundy mixed with the traditional blue jeans is a casual and practical look, and the side braid adds a girly vibe to it. If you want something extravagant, match it with printed loafers (such as leopard prints) or a fun backpack. Black jeans or palazzo pants, black blouse and a metallic pair of oxford shoes or loafers are just the perfect mix of edgy and fashionable. 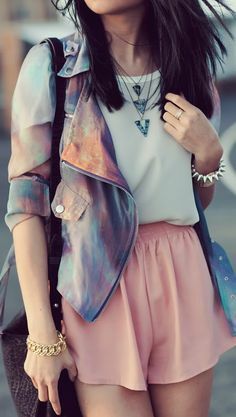 Instead of metallics, you can also wear any other shade that makes your outfit pop, such as coral orange, royal blue or hot pink. If you are not a fan of a bold all-black look, go monochrome with olive, beige and taupe shades! 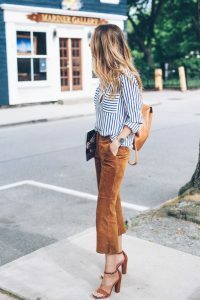 Another thing that we love about this outfit is the way it combines a casual bomber jacket with more elegant pants, but instead of heels, we recommend wearing a more comfortable pair of shoes. Checked skirts, whether they have the red-black, green-blue or monochrome black and white combination, will never go out of style. 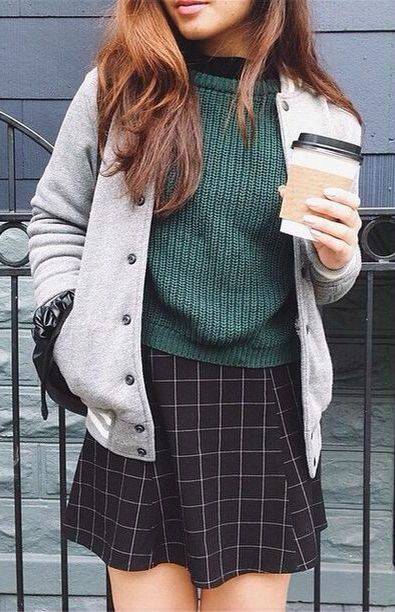 This outfit features the more modern, monochrome one with a dark green sweater and a cozy gray baseball jacket. If you want to keep things a bit more conservative, choose a thick pair of black tights and ruffled socks under a pair of oxford shoes. We love the vintage, 90’s vibe of this outfit from the oversized pink suede jacket to the graphic white T-shirt, the black jeans, and the simple canvas bag. Another thing that is so great about this outfit that it doesn’t need any accessories at all – the color and fabric combinations are interesting enough on their own. 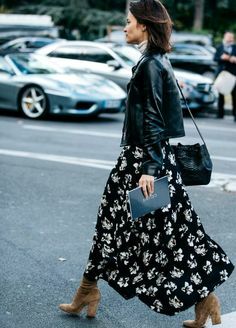 If you are feeling extra fancy and would like to bring back the summer night vibes, go with a chiffon or cotton maxi skirt and an edgy leather jacket. Keep the focus on the skirt and the jacket by adding a simple top or white satin shirt to your outfit. A less elegant yet still cool and youthful way to rock the maxi trend is matching a maxi shirt with a pair of jeans or slim fit trousers. Choose an asymmetric shirt or leave the buttons undone and wear a top underneath your shirt. 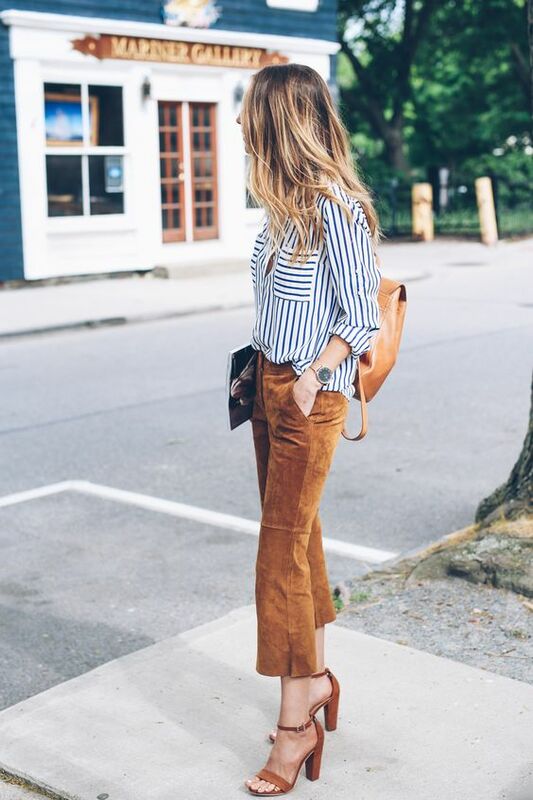 Tan suede pants and a dark blue and white striped blouse is a match made in heaven, especially if you add a caramel, geometric backpack to your look! A duster coat and cigarette pants is a great combo if you are looking for something elegant and a bit more edgy and masculine. While the duster coat is a bit oversized, the cigarette pants have a slim fit. If you want to make it more youthful, add a beanie or a backpack to your outfit. 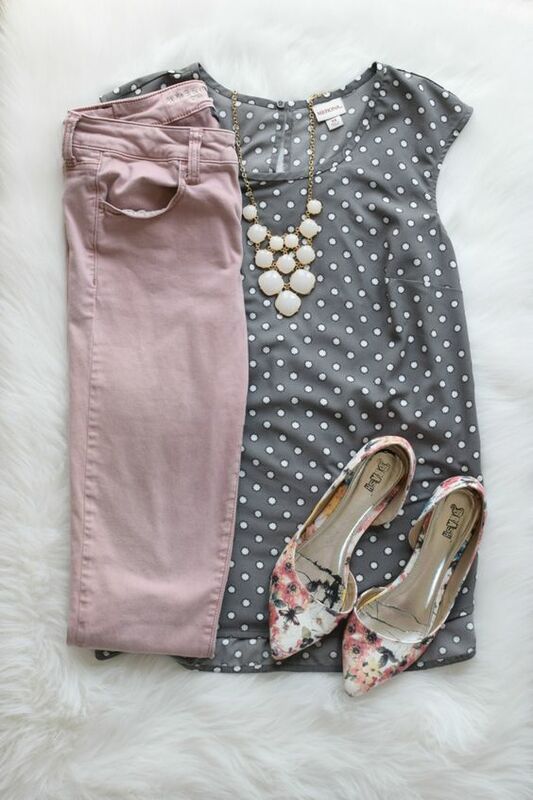 The polka dotted, gray and white T-shirt goes together beautifully with the off-pink pants, but the focus is definitely on the accessories with this one. The floral ballerina shoes and the statement jewelry look stunning with this combination. 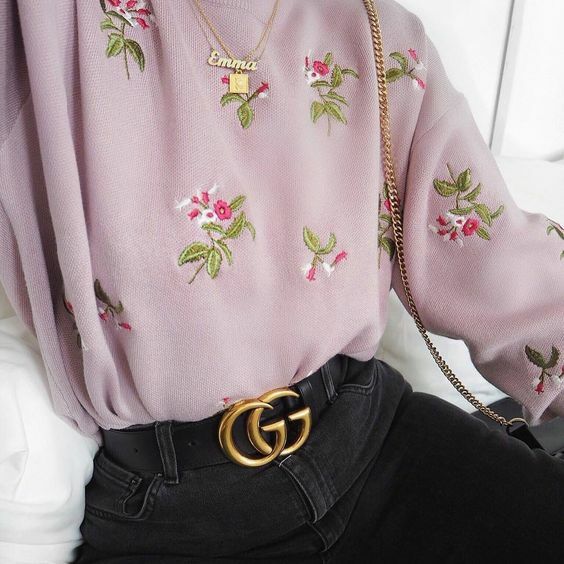 If you want to look very minimalistic and choose clothing items that create an effortlessly cool look, try out a black turtleneck, long sleeve top with white, high-waisted pants and a caramel or beige backpack. Besides looking super chic, the brown bag will give a warmth to your outfit. 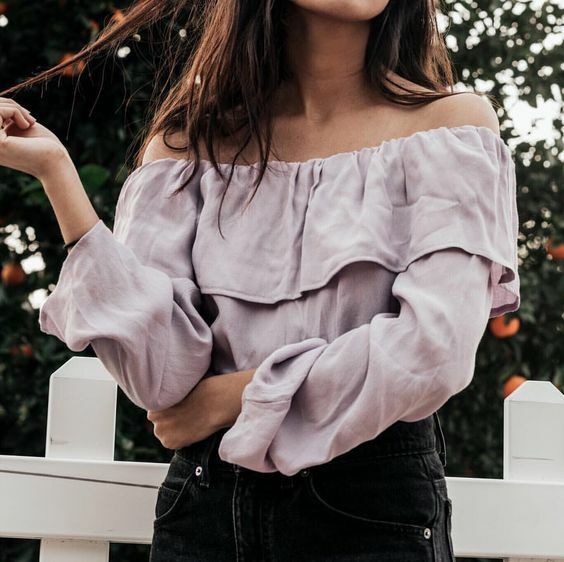 An off-shoulder, long sleeved blouse with black or ripped jeans has got to be one of this season’s biggest trend, and besides being comfortable, it shows just the right amount of skin. 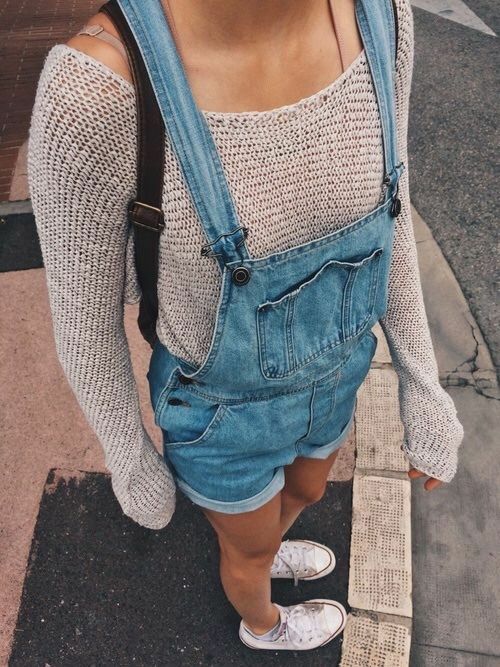 If you’d like to cover yourself up a bit more, wear off shoulder tops with black or denim dungarees. 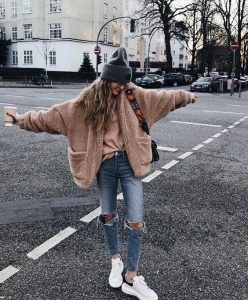 An oversized scarf, a long cardigan and a hat matched together is not only perfect for chilly autumn days, but is also a great choice if you are feeling extra comfy and would like to put together something simple, yet still interesting. If it’s a bit too casual for your taste, simply add a few exciting elements to your outfit, such as earrings or a printed T-shirt. Peter pan collars (especially if they are beaded or jeweled) are beautiful and subtle accessories to any outfit, especially for the classic school girl look. Wear a cute, peter pan collared shirt or blouse with a sweater on top and with jeans or a checkered skirt. 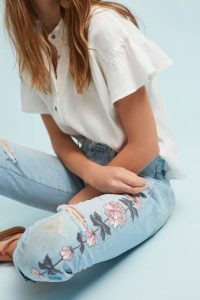 A lighter denim shirt and high waisted, dark blue jeans and a black leather or suede jacket is the ultimate cool and hip outfit that’s perfect for first dates, brunch or first day of school. 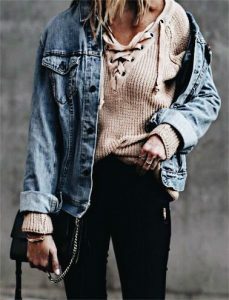 If you would like to really experiment with denim, change the black jacket to an oversized denim jacket in a different color. The cute cat print with the monochrome, black and white skirt looks stunning with the oversized, pastel blue fluffy coat, and with a natural no-makeup makeup and beachy waves, it’s the absolute perfect first day of school look for girly girls. Galaxy jackets, bird print blouses, Alice in Wonderland jumpers…there is an endless list of fun and crazy prints you can experiment with if you want to put together a playful, different look, guaranteeing all eyes will be on you. 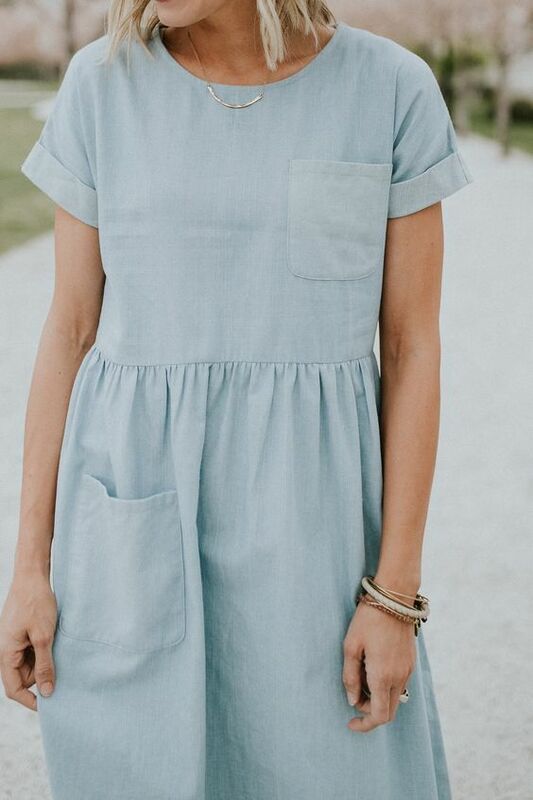 This denim dress is special in every little detail: from the oversized design to the pocket detailing, the T-shirt silhouette and the slimmed waistline, it just screams a feminine and playful outfit, especially with the small, delicate silver necklace. If your school is more forgiving about makeup, you can also rock it with a coral or hot pink lipstick! Whether you are a fan of jeans or denim jackets (or both), adding a few embroidered elements and floral prints will only make it look cooler. 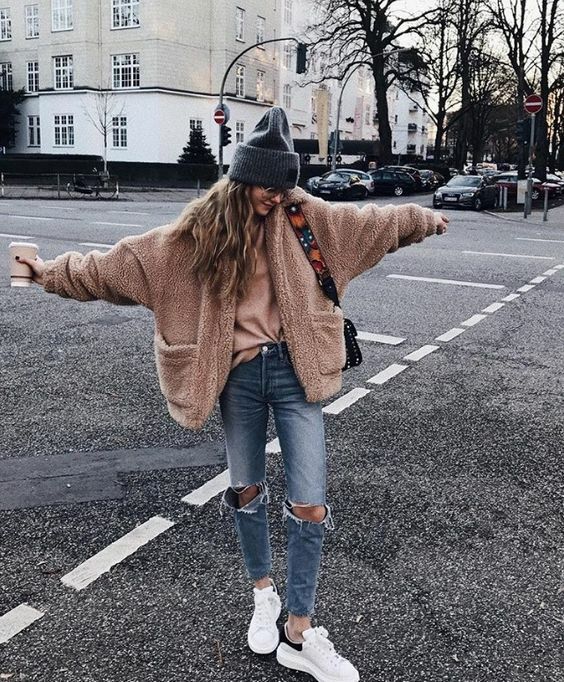 If you want to feel super cozy and comfortable and get ready for a long day, add an oversized, fluffy or plush cardigan to your outfit and wrap yourself in it! To make the whole look even cozier, add a beanie to the look. Any outfit will look instantly cooler with a colorful or printed pair of sneakers. 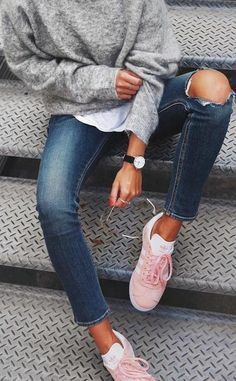 Besides being sporty and hip, sneakers are probably the best alternative to wear for a long school day, because no matter how much you have to walk and how many hours you have to survive, they will give you the support and comfort you need. 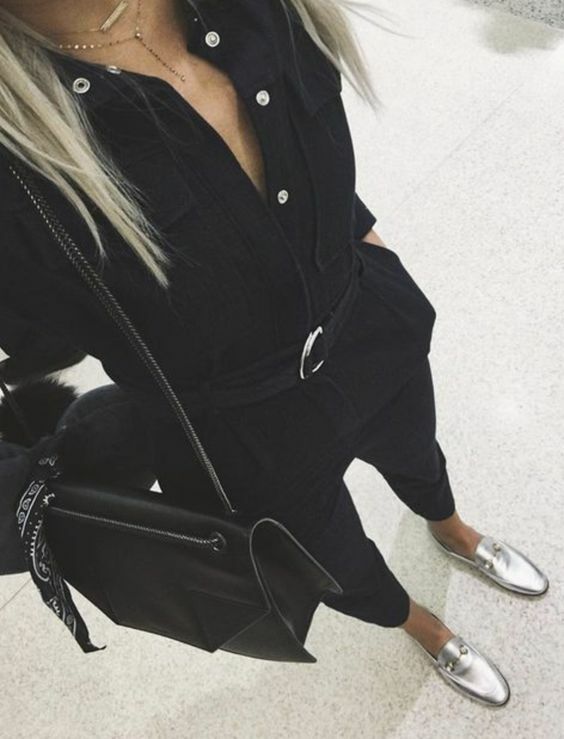 Jumpsuits are great choices for the first day of school: because of there are endless various styles, it is super easy to find one that matches your personality and your style! Our choice is this beautiful, wide legged striped one, which can be worn with both black or brown accessories.